Simple Feel Good Washbag Set is rated 5.0 out of 5 by 2. Simple Skincare cares for you day after day to ensure your skin is clean, fresh, perfectly hydrated and free from any sign of sensitivity. 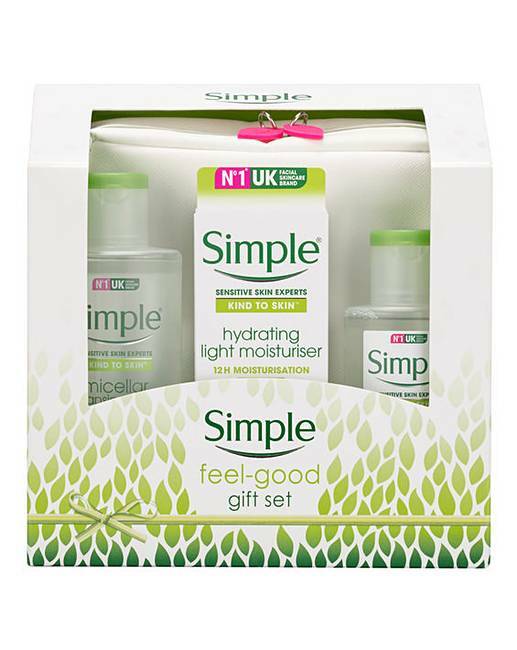 This gift set contains three best-selling Simple products, all in full sizes. No artificial perfumes or colour added. Gift Set contains: 200ml Micellar Cleansing Water, 125ml Hydrating light moisturiser, 125ml Eye makeup remover and a white wash bag.